A classic design, simple leaf pattern adorns the front borders, knit in one piece seamlessly from the top down. 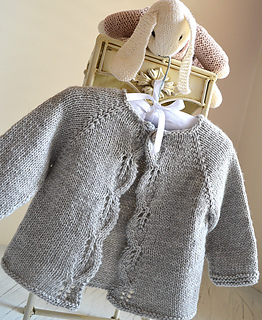 This little cardi is sure to become your go-to knit for babies. 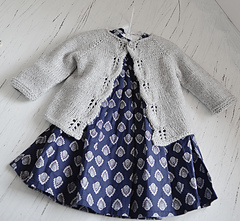 Would be perfect for baby to wear on cool summer nights and sunny autumn days. Pattern comes with a schematic. We have graded this pattern as suitable for the intermediate knitter. MATERIALS REQUIRED -- LIGHT #3, Double Knit, Light worsted. 4 mm (US 6 : UK 8) needles.